Welcome to this special HomeGame News Gateway Convention report. Aimed primarily at those who can't attend, we hope to provide daily updates on the happenings in St. Louis. For those of you that are attending, feel free to look around and maybe check things out from a new perspective – the HomeGame perspective. Ideally, we're going to work to get you summaries of the day's happenings in the form of journal entries from our dedicated staffers who will be on-location the whole weekend. Look for exciting supplements to these reports that might include audio, video, and other photographs. Please be aware that we can't know how well our technology will work until we get there and start using it, so be patient if we can't get all these things up during the convention, because we'll be sure to get them up after the convention. 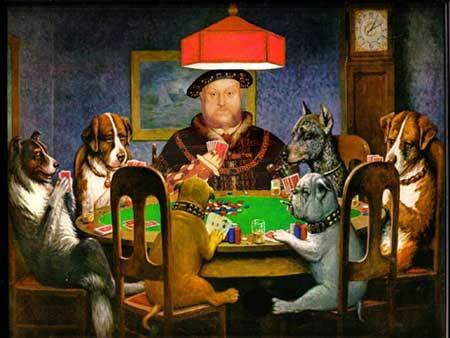 The only painting in the world that truly captures the magic of the Henry VIII "Hotel." In the DAY 2 section, Real Video files of Saturday's MST3K Panel. A photo of the hotel worker with BIG HAIR in the DAY 1 section. Video from DAY 1 of the arrival of the Lamberts and Thayer. In the PRE-CON section, video from Benkis' room party which includes Grasso, DUCA, Jamie, EvilJen, ReaperG, and Connie punishing David Ramirez for being naughty.